It’s a fact: Once you are in a collision, the odds increase significantly that you can get hurt in a subsequent collision if you don’t move your vehicle out of traffic. 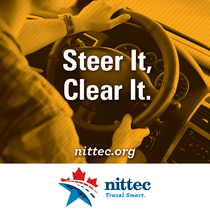 If you’re involved in a collision on a ramp or in a travel lane of an expressway or roadway, NITTEC suggests the following to help ensure your safety, keep traffic moving, and allow fire, police, and other emergency personnel to reach you faster: If you and your passengers are unhurt AND your vehicle can be driven, then move the vehicle out of a travel lane to prevent a second collision with other vehicles on the road. Park your vehicle in a safe area such as the roadway shoulder or an adjacent parking area, where you can more safely exchange information or wait for police, fire, or other emergency services. In other words: Steer it...Clear it. For more information, watch the video below.